Above & Below: nails inc. in Brompton x shown above, is a light pink-toned mauve with a frost finish. 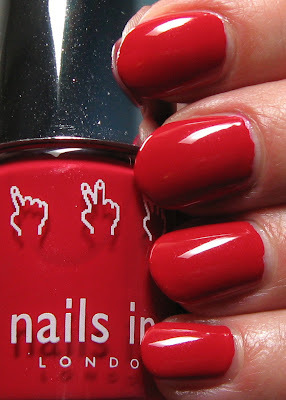 Shown below is St. Jame's, which is a warm-toned red that appears as a creme, but actually has a very slight shimmer to it. The shimmer is more obvious in the bottle than on the nail. Both polishes are shown using 2 coats, and the application was fantastic. This past summer I did a great swap with Tali, one of my readers from England. If you're not familiar with her blog, check it out for some beautiful and inspirational makeup looks. 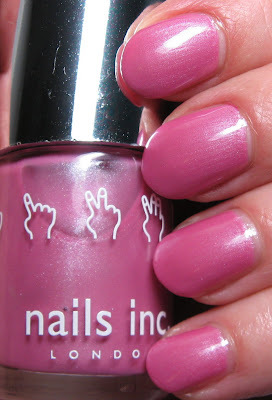 Some of the items she included were these two shades from nails inc., Brompton x and St. Jame's. Although I've heard the praises of this brand, this is my first time using them. As far as I know, these aren't available in the U.S., so I'll have to set my sites on them elsewhere! The application was extremely nice, because the formula is just the right consistency and highly pigmented. I used two coats and had no issues whatsoever. In looking at their web site, they have quite a wide variety of shades and finishes. This is another brand that I wish we could get our hands on a little easier here in the States, but I'm happy I had a chance to discover these, thanks to Tali. I love Nails Inc polishes! They have so many great colours to choose from. Both of these polishes are lovely colours. Lovely swatches! I love the few Nails Inc polishes I have, and want more! Two pretty shades. Love the shimmery one. Both look equally lovely on you. itskarmababy~thank you! I'm glad she sent these because I would've had a hard time picking what I wanted and she did a great job. Skye~see, that's the trouble with us! Ha-ha, glad you like them. Belle~they applied so nice, not to mention that the colors are fantastic! Delaynee~I really like this one too. Such a perfect red creme. rijaH~thanks, glad you like them! Lucy~I like them both for different reasons, but I really like them both a lot! Great formula. You have a great blog! We share the same passion for nail polish!